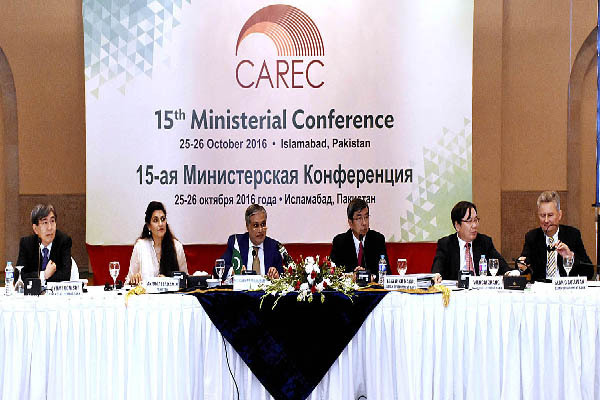 ISLAMABAD, Oct 26 (APP): The two day 15th Ministerial Conference of the Central Asia Regional Economic Cooperation (CAREC) with the theme “Linking Connectivity with Economic Transformation in CAREC” concluded here Wednesday. Finance Minister, Senator Mohammad Ishaq Dar chaired the Ministerial Conference with Vice President Asian Development Bank (ADB) Wencai Zhang as co chair. Prime Minister Muhammad Nawaz Sharif graced the inaugural session of the Ministerial Conference. President, ADB Mr. Takehiko Nakao was also present on the occasion. Senator Dar in the concluding remarks appreciated the leadership of President Nakao and thanked him for the continued commitment of ADB to support economic cooperation and development amongst CAREC member states. He welcomed the Ministers and senior officials from ten member states, i.e, Afghanistan, Azerbaijan, China, Kazakhstan, the Kyrgyz Republic, Mongolia, Pakistan, Tajikistan, Turkmenistan and Uzbekistan who are attending this conference. Senator Ishaq Dar also warmly welcomed Georgia, the newest and 11th member of the CAREC family and said that it was a memorable occasion that Georgia joined the CAREC family at the 15th Ministerial conference hosted in Pakistan. Mr. Genadi Arveladze, Deputy Minister of the Ministry of Economy and Sustainable Development of Georgia presented remarks on behalf of his country and formally joined the Ministerial conference. Multilateral and International development agencies including International Monetary Fund, World Bank, Islamic Development Bank, Asian Development Bank, UNDP, Japanese International Cooperation Agency (JICA), USAID, DFID of UK, EBRD and WTO participated in the meeting. conference, stating that it is a sign of the country’s commitment towards regional cooperation, increased connectivity, shared prosperity and elimination of poverty. Finance Minister while chairing the meeting gave an overview of Pakistan’s economy and said that all key macroeconomic indicators have recorded significant improvement in the country over the past three years. He underlined that improvement in fiscal sustainability, foreign exchange reserve position, and governance structures, has led to the emergence of Pakistan as a trustworthy and long term destination for global partnerships, collaboration and investment. He said that Pakistan is now well positioned to play a pivotal role in enhancing economic cooperation between CAREC member states. He emphasized the importance of developing road, rail and energy corridors within the CAREC countries and said that the China Pakistan Economic Corridor will complement the regional connectivity initiatives of CAREC countries as it offers a massive opportunity for connectivity between Central Asia, Middle East and Africa and is bound to play a defining role in the economic development of CAREC region. Representatives from all participating countries expressed their condolence to the Finance Minister on the loss of life and the tragedy which struck the Quetta Police Training College. They expressed solidarity with Pakistan in these times of grief. The Ministerial Conference was followed by a CAREC Ministerial Retreat with Finance Minister of Pakistan and President ADB in chair. opportunities to ensure better economic cooperation and regional connectivity among the CAREC Member countries and resolved to undertake all the challenges collectively. They expressed gratitude to the government of Pakistan for the hospitality and congratulated the Finance Minister for successful conduct of all activities within the CAREC program.